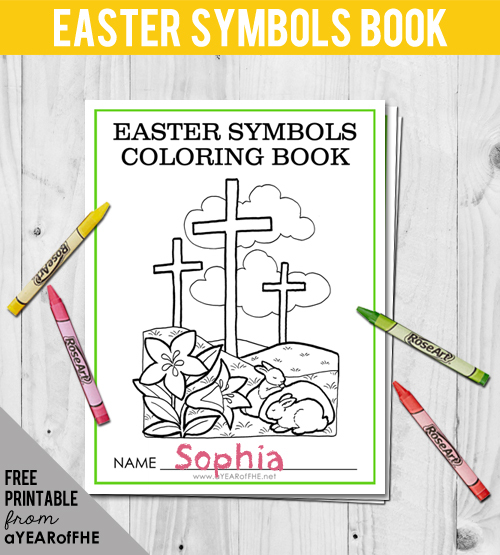 What You'll Need: scriptures, GAK Pictures 240, 227, 231 and 233, symbols of Easter including a branch, egg, white cloth, nail, a stone and flowers, coloring book download and coloring tools, fill-in download and pen/pencil. Scripture: Matthew 28:5-6 - And the angel answered and said unto the women, Fear not ye: for I know that ye seek Jesus, which was crucified. He is not here: for he is risen, as he said. Come, see the place where the Lord lay. 1. This person loves everyone very much. 2. He lived on the earth long ago and organized his church. 3. He taught us how to live and be happy. 4. He blessed people and told them to be kind and loving. 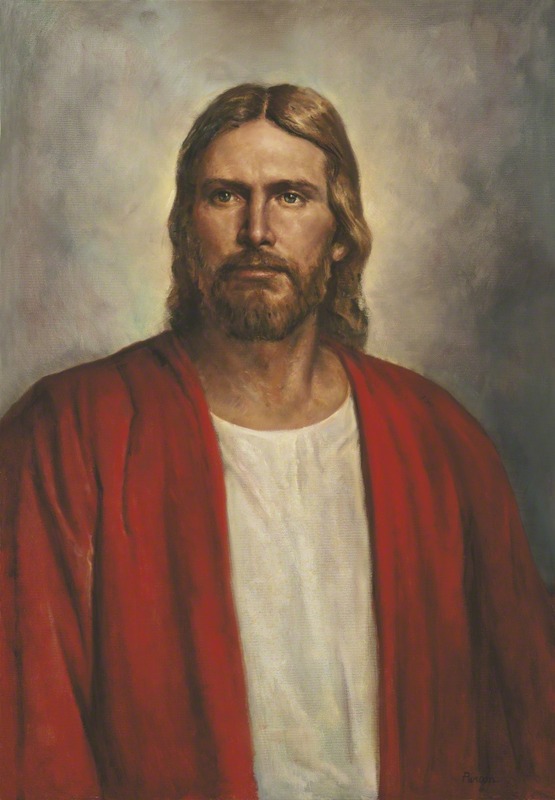 When the children have guessed (or you have told them) that the person is Jesus, display the picture. When Jesus was on earth he taught people, healed them and told people how to return to Heavenly Father. Many people who lived during Jesus’ time on earth loved him. However, some people did not like Jesus. They did not believe he was Heavenly Father’s son. The people who didn’t like Jesus were very mean to him. They didn't want him to be able to teach and lead others. They were afraid he would become to powerful. They decided to take his life. Show picture (GAK 227) of Jesus Praying in Gethsemane. • What is Jesus doing in this picture? 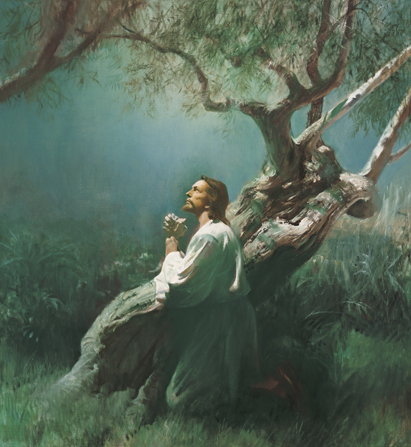 Before Jesus died, he went to pray in a place called the Garden of Gethsemane. Jesus suffered there for our sins so we could repent and be forgiven of the wrong things that we do. Jesus was the only person who had the power to do this for us. He did it because he loves us so much. The next day wicked soldiers drove nails through Jesus’ hands and feet and hung him on a cross. They left Jesus on the cross until he died. When Jesus died, his spirit left his body and went to heaven. Remind the children that each of us has a spirit. Our spirits cannot be seen, but they are what make us alive. Show picture (GAK 231) of Burial of Jesus. The people who loved Jesus took his body and wrapped it carefully in cloths. They carried Jesus’ body to a tomb (a cave-like place where people were buried) and gently laid his body there. 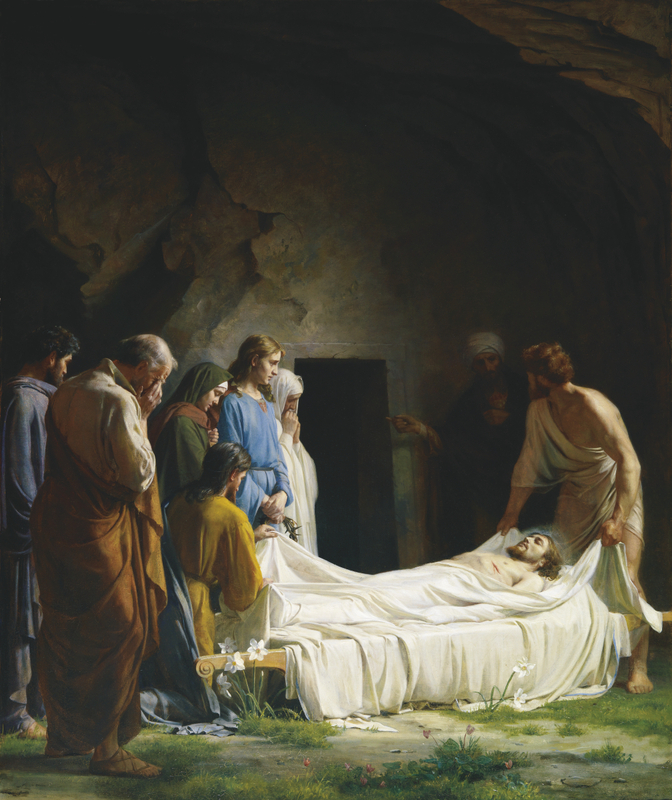 Three days after he died, Jesus' friend Mary went to see his body, but it was gone. She was afraid that someone had taken his body away. She was sad. But Jesus was resurrected. He was alive again. When Jesus died, his spirit left his body. When he was resurrected, his spirit came back into his body. 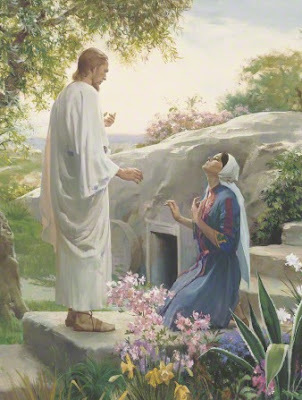 How do you think Mary felt when she saw her friend, Jesus, was alive again? How do you think we will feel when we get to see our friend and brother, Jesus Christ, again? The day Jesus was resurrected was the first Easter. We celebrate Easter each year to help us remember that Jesus was resurrected. Because Jesus suffered for our sins in Gethsemane and was Resurrected, each of us will be resurrected and can return to live with our Heavenly Father again. Pass around a basket containing items that represent the true meaning of Easter. 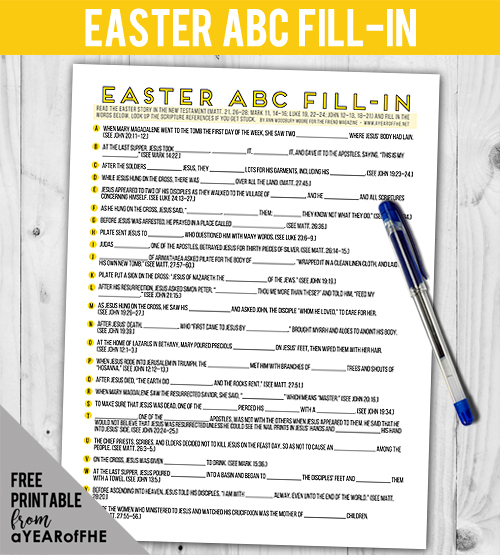 Have your children take turns picking up an item from the basket and then tell what the item represents in the Easter story. 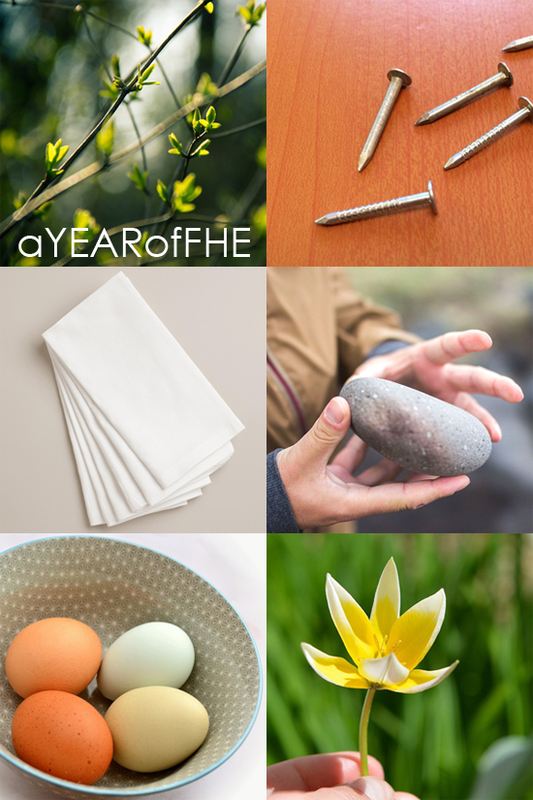 Choose from the following ideas or select your own Easter symbols to place in your basket. Flowers – The resurrected Christ’s appearance to Mary in the Garden near the tomb. Share your testimony about the resurrection of Jesus Christ. Express gratitude that we can return to live with Heavenly Father again because of what Jesus did for us. What a great lessons. Love the mini story books too! Will be great for my daughters. Thank you!!! We used this lesson last night and it my four year old son loved it!! Thank you! This was a great lesson for my 7 and 4 year old. I let them choose an object out of the basket to hold while I told the story of Jesus so that they would pay attention better. I have a 3yr old boy and we are just getting started on our FHE lessons. I'm so glad I found your blog and I'm excited to start using your amazing lessons. Thanks so much for sharing! Just wanted to say thank you for posting your wonderful ideas. I just discovered your site this year (2011) and it has helped me out so much. Thanks! thanks! This will be great for our Easter lesson tonight. My 2 year old loves any FHE lesson that has something to color. Thank you so much for putting these lessons together! Liked the simple questions easy for my small children to understand. Thank you for saving our FHE tonight! Perfect simple lesson for my 4 year old. He will love the coloring pages. Your site is great! I love all the freebies (I used some for conference this year) and you have great, simple ideas. Thanks! This mini-book is fantastic! Thanks for making it. A way I used the mini-book was cut out all the pages and had my kids put them in order first, then we stapled and colored. Worked well for little ones! Thanks for the activity booklet! The girls learned about the resurrection in Primary on Sunday and they were wanting to learn more! I am using this lesson tonight. I only have a few days left before Easter, so it was so nice to just look on your site for the perfect lesson. I knew right where to look! Thanks again! My friend recommended this blog and it's been my go-to resource for several weeks. Thank you SO much for these practical, fun, inspiring, kid-friendly ideas. I'm a BIG fan. I love the idea of passing around the basket. Thank you! I'm excited to explore your blog! What I have looked at so far looks great! Thank you for this FHE outline! I am going to do this with my family tonight! Thank you for sharing! I love how you use well known pictures of Jesus to teach the message. This will definitely help my little ones learn more about Jesus as they see this pictures in other places. 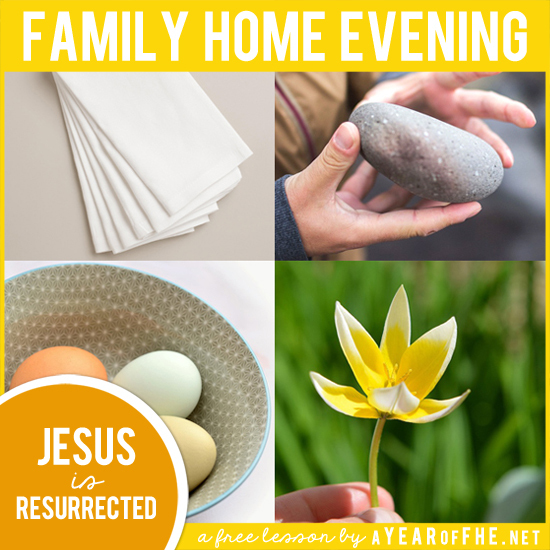 I included this great lesson in my Primary Easter lesson round-up at https://www.loveprayteach.com/articles/20170408_3 Thank you! Thank you so much for all that you do with these FHE lessons! I love using them for my family! I can't download the pdf for this one, though- it just brings up a blank page that says "box" in the heading of the tab. Nothing downloads though- any ideas why? I'm able to download other lessons however? !